This very random day started by feeling deeply unsettled over my torn apart kitchen and cluttered beyond recognition kitchen table. When crap fills up the coveted space we're supposed to have family meals I sort of fall apart and become obsessed with other details. Like playing on Facebook all morning. While over there, my friend Missy asked that I fill out 30 Random Things About Me and of course I had to comply. Not doing so would have me doing productive things. Like leaving the house for the first time today. Or God forbid, dishes. Here are my answers. If you feel up to it do this yourself and please come back and let me know so I can visit! First though, the recipe, as it's a heck of a lot shorter than my rambling. You can make this with regular eggnog too if you can’t find the other. The only trick to this quick breakfast is butter. You must very generously butter your pan or the bread will stick like the dickens. 1. Place some eggnog in a wide shallow bowl. Set bread and bowl beside the stove. 2. Heat a good dollop of butter in a skillet over medium high heat until the foam begins to subside. Soak bread on both sides and shake off the excess nog. 3. Fry bread on one side. When golden brown, lift up the slices and add a little more butter. Flip the bread over and cook until done. Repeat until happy. 4. Serve with a sprinkle of powdered sugar and maple syrup if desired. 1. When my kitchen table is covered in crap I feel deeply unsettled. 2. I love my dog like he’s my child and feed him accordingly, much to the dismay of his vet. 3. I love gleaning (stealing) fruit off trees that stick out in local alleys. 5. I am part naughty/ ornery/ rebellious at all times by choice. 6. I am afraid of hurting myself again, but refuse to stop taking risks. About twice a year I beat the holy snot out of myself in some dumb way. This will probably be how I die. 7. After visiting my mom I always run home and purge my house of clutter. Speaking of mom’s house, big houses overwhelm me. All I can think about is how much crap you can stuff into too much space and how expensive the heating bill is. 8. I’m an inclusive person and like to involve everyone and introduce all my friends to each other. 9. I am obsessed with conversion vans and badly want one. I love the idea of staying packed up and leaving town at short notice as I travel frequently. 10. I was at one time an Army soldier. 11. White walls bore me. So do white kitchen appliances. 12. I once swore to God as a professional photographer I would never shoot food. Lesson learned: Never tell God you won't do something. 13. I love to read. Love love love to read and very frequently stay up until 4am doing so. 14. I’m sad my daughter doesn’t like to read, but I’m working on her. 15. I tell my husband every single day we need to move to Austin, Texas and he ignores me each and every time. I’ve considered leaving him over this issue. Usually in the dead of winter when it’s freezing miserable cold out. 16. I’m only serious when I’m angry, which isn’t very often. 17. I think it would be fun to be a carnie traveling around the country setting up fairs and I haven’t ruled this out as a future profession. 18. I wish my parents liked me better and wanted to spend actual time with my family and I. However, I don’t waste too much time on wishful thinking and have adopted other parental figures. 19. I love my foodie friends. If you are a foodie, you are my friend. 20. If you make me laugh I’m loyal forever. 21. If I make you laugh I’ve done my duty for the day. 22. I make fun of and mimic serious and stuffy people. 23. I love my brothers and their families! They’re the best. 24. I try to use my favorite pink skull mug every morning and am sad when it’s dirty. 25. I believe in breakfast and don’t trust people who skip this favorite meal. 26. I’m proud to be University of Idaho alumni only because I get to say I’m a “Vandal”. 27. After living in the Czech Republic a few years ago I’ve come to deeply appreciate considerate, kind American males. Our men are the nicest anywhere and this is one of few places we can have true male friends. 28. I like to ride my bicycle; I like to ride my bike. Sing it with me now! It’s true though. When it’s warm outside I enjoy riding the 24 miles to Troy, Idaho and back. 29. If I’m told “no” I find a way around it even if I have to pay the consequences. Sometimes it involves things like painting the kitchen behind my color phobic spouse's back while he's at work. Or sneaking alcohol into my cooking for Jesse's alcohol adverse family. 30. My favorite thing in the world is to feed and play with my family, friends, neighbors, strangers and dog. Nothing makes me happier. What a list Laura, I love it! I like your 30 things.. Some i knew, most i didn't ;) Foodie friends are the best, aren't they?? This sounds SO GOOD. My boyfriend adores egg nog AND french toast, so you know I'll be trying it! And such a cute list, I enjoyed reading it! I loved reading these Laura! You and I are so similar. It's crazy. Moan. 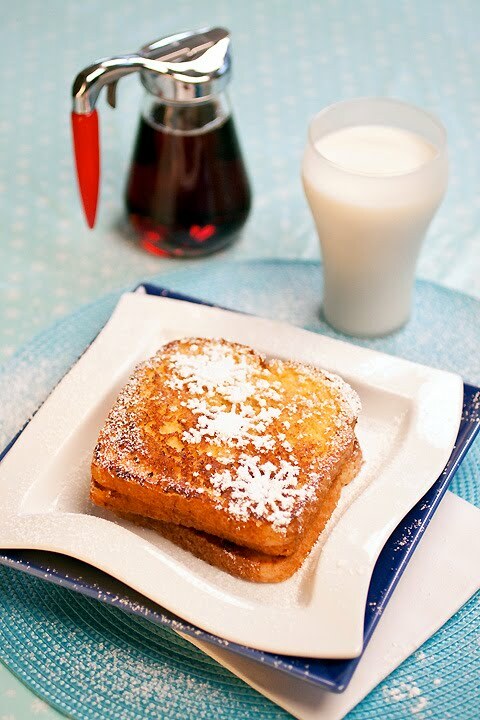 Egg nog french toast. It's like you know what I want before I want it. Love the list. LOVE the Eggnog French Toast!!! Haha you sound so fun! Of course, I've known that long before from your creative recipes. I love french toast, and you've only made a great thing better with the addition of pumpkin and eggnog. Happy holidays! What a fun post! I'm going to head over to my blog and do the same thing! You made me laugh and drool at the same time. Great list. Hi Laura! I finally signed up for your email posts! Steve would really like this recipe so we'll have to try it soon (plus it's easy to make with a ten month old scooting under your feet). Loved your list by the way - so you want to be a carnie too? Sweet. . . I didn't know you wanted to be a carnie Dorian! Very cool. Maybe when we get old and the kids are grown. Loved your "about me" list..lol..
What a great idea for French toast. I also enjoyed reading your answers...funny I actually like white appliances (but not white walls, they bore me too). I love your list, kinda wish we could hang out now! Nice to *meet* you. I also received the split pea soup...it is gone! I followed your recipe and my 2 year old even ate 3 bowls! Hi Laura! I loved your list. I only wish I could have been enjoying some of that french toast while I read through it! I had no idea that you were in the army...and I'm right there with you on kitchen clutter. It drives me bonkers! Thanks for sharing, my sweet friend! Have a great Tuesday. You make me laugh(so you've done your duty)! I loved reading your list and getting to know you:) Your list is way more entertaining and interesting than mine would be! Ok I'm lovin this list! So fun. And the french toast.... would love to have that tomorrow morning... if only I could wish that into happening! thank you for reminding me of my favorite holday breakfast :) this is also the only other time of year i consider rice pudding breakfast. Heartwarming list - thanx for sharing! And french toast soaked in eggnog!!! Why have I never heard of this? That will be happening at my house sometime this month!!! I came for the eggnog, but definitely glad I stayed for the "random" answers. I was smiling ear to ear. Got to get me a pink skull mug. There was so much fun stuff there! This recipe looks sooo decadent and amazing! :) And I LOVE your list - I'm totally with you on #8, #11, #13, #20, #29 & #30!